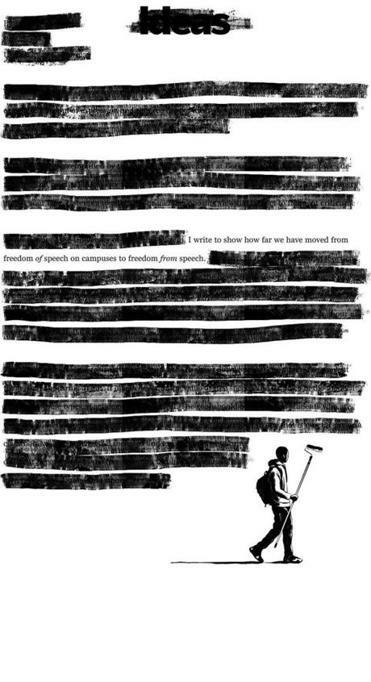 When I was growing up, a favored comeback to perceived censorship was: “It’s a free country!” Whether this was spouted at a parent, a sibling, or an erstwhile friend, what it meant was people could speak their minds, that such freedom of speech was not only encouraged but guaranteed in the United States of America, so long as you didn’t yell, “Fire!” in a crowded theater. Years later, the sanctity of free speech in our country is hardly guaranteed — at least not on our college campuses, where freedom of expression and the free flow of ideas should incubate discovery and learning. This is an irony that gives me pause even as I write this. As president of the University of California system, I write to show how far we have moved from freedom of speech on campuses to freedom from speech. If it hurts, if it’s controversial, if it articulates an extreme point of view, then speech has become the new bête noire of the academy. Speakers are disinvited, faculty are vilified, and administrators like me are constantly asked to intervene. In the 1960s, as exemplified by the Free Speech Movement at Berkeley, students on campuses demanded and received the ability to protest the Vietnam War. This was free speech, loud and angry and in your face. Today many of the loudest voices condemning speech and demanding protection are students on those same campuses. Listening to offensive, or merely opposing, views is subject to frequent criticism. What has happened, and what are we to do about it? Well said, President Kerr. But what does this ideal mean in today’s environment? First, a look back. The oldest versions of the university were institutions of indoctrination, whether by the church or by the state. Not until the potent combination of the Enlightenment with the revolution in natural science inquiry did the value of free speech in democratic societies surface. But freedom of speech has had a bumpy ride at American universities, echoing our country’s uneven interpretation of the First Amendment. In 1900, for example, Jane Stanford, the benefactor of Stanford University, forced the firing of a faculty member in large part because he supported labor unions. Not until the Berkeley Free Speech Movement of the mid-60s was the principle established that the only limits on free speech should be those defined in the Constitution, at least as far as our nation’s public universities were concerned. Has this concept now been turned on its head? Not necessarily. “The times,” to quote Bob Dylan, “are a-changin’.” And so are our students — not to mention the challenges many have overcome just to gain admittance to a university. The University of California is the largest and best public research university in the country. In the 1960s, when the Free Speech Movement began, our student body was 55 percent male and overwhelmingly white. Today, 53 percent of UC students are women, 42 percent are the first in their families to attend college, and nearly 40 percent of this year’s entering class identified themselves as either black, Latino/Latina, or a member of another historically underrepresented ethnic or racial group. Moreover, sexual identity was hardly on the radar in the 1960s. Today, students self-identify in myriad ways. Students, therefore, come from a much broader range of backgrounds, and they often benefit from gathering with others of similar backgrounds to share experiences and support one another. At UC we have many different types of student centers and student activities; some of our newest are for undocumented students. You can call these “safe spaces,” but I call them a good idea. The more difficult issues arise when students seek to shout down speakers or attempt to prevent them from appearing at all. If one believes in the value of free speech and its place in the modern university, these types of actions are antithetical. I personally disagree with many of the sentiments expressed in the public spaces on our campuses. But the way to deal with extreme, unfounded speech is not with less speech — it is with more speech, informed by facts and persuasive argument. Educating students from an informed “more speech” approach as opposed to silencing an objectionable speaker should be one of academia’s key roles. After all, these students will graduate into a country where objectionable speech is the current coin of the realm. This does not mean that all speech is permissible. That which is designed to personally intimidate or harass falls outside First Amendment protections, as outlined by the Supreme Court. And remember that example of yelling “Fire!” in a crowded theater. These exceptions, however, should be narrowly construed because history teaches us that even narrowly drawn exceptions to free speech inevitably lead to broader limitations. Just read the Supreme Court’s opinions in the early 20th century, and you’ll know what I mean. What about speech in the classroom? Do, or should, different standards apply? What about those so-called trigger warnings that have been so vilified by some in the (First Amendment-protected) press? If it hurts, if it’s controversial, if it articulates an extreme point of view, then speech has become the new bête noire of the academy. Speakers are disinvited, faculty are vilified, and administrators like me are constantly asked to intervene. Here the academy must rely on its faculty. Given the broad range of life experiences our students bring to the university, our faculty have a professional responsibility to create an inclusive learning environment, as persuasively argued by Erwin Chemerinsky and Howard Gillman in an upcoming book about free speech on college campuses. If a professor tells students that a piece they are about to study explores the difficult topic of race, for example, that could be construed as a trigger warning. It also helps students appreciate what they are reading so as to bring their perspectives into even richer classroom discussion. The key is to ensure that the faculty itself is enforcing professional standards guided by peer assessments of the quality of scholarship or teaching. Especially in the humanities and the social sciences, the goal is to foster constructive engagement and to prepare students to listen, discuss, argue, and learn about topics that may be difficult for them personally. I think of this kind of education as preparing students to be resilient, even in the face of speech that they feel undervalues them or diminishes their own experiences. I object to the word “coddling.” I’m not especially fond of the letter recently sent by the dean of students at the University of Chicago that seemed to support free speech Darwinism. As stated earlier, even free speech has its limits: time, place, and manner restrictions, for instance. Chalking an anti-immigrant pro-Trump slogan on a sidewalk is one thing; spray painting it on a building is another. The goal of our university education today should be to prepare students who are thoughtful, well-informed, and resilient. The world needs more critical, creative thinkers, and American higher education does a better job of producing them than any other higher education system in the world. We seek to make the world a better place for the next generation, and teaching the values and responsibilities of free speech is inextricably linked with this goal. I prefer a campus that is loud to one that is quiet. I prefer a classroom where students feel included and are encouraged to bring different perspectives to the fore. I want a faculty that enforces its own professional standards among its peers. These are the three lode stars that should guide our efforts. These are the values I will embrace when particular episodes are brought before me. Consider this my own trigger warning. Just sayin’. As president of the University of California, Janet Napolitano oversees a system of 10 campuses, five medical centers, three affiliated national laboratories, and a statewide agriculture and natural resources program. The UC system has more than 234,000 students, about 208,000 faculty and staff, and more than 1.6 million living alumni.